I am an Episcopalian and have an MA in systematic theology. I did my thesis on the theology of Paul Tillich. I am also a committed Buddhist practitioner, and have taken refuge in the Three Jewels and received the Five Mindfulness Trainings while on retreat with Zen Master Thich Nhat Hanh. I have also completed the Heart of Warriorship Trainings in the Tibetan Shambhala tradition. My approach to spirituality is expansive, but not eclectic. By this, I mean that I am not interested in picking and choosing appealing elements from a variety of traditions. Instead, I seek to understand commonalities and connections among traditions. These points of contact are sometimes masked behind profound differences that arise from both culture and experience, but I find that deep exploration yields interesting results. I am more interested in learning to live with hard questions than with easy answers. In late 2012, I helped found Living Christ Sangha, which is a community at St. Bartholomew's Church that comes together every Sunday for mindfulness meditation. 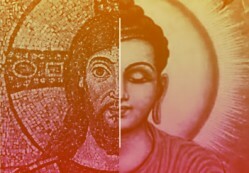 Our practice is informed by both Buddhism and Christianity. Many of us stay afterward for the 5pm Eucharist. This section of the site will feature my thoughts and essays on topics related to my theological and spiritual interests. This page gives some details regarding my explorations of Buddhism and Christianity.